When I was young, I used to join in the Christmas revelry because one my friends, HS, was the grand daughter of a family which built and managed the only church in town. I used to joined her and other church members when they went Christmas carolling. I, too, joined in the fun and festivities when she and her family decorated their Christmas tree. Thinking of this brought back happy memories of my childhood and Christmas! Well, those were the days! "Christmas" brings images of Santa Claus, reindeer, pine trees, the colours red and green, mistletoe, white snow, snowflakes and of course, the inevitable snowman! I remember seeing a picture of "snowman buns" somewhere. It was cute and like I said, somehow the snowman brings me connotations of Christmas cheer! 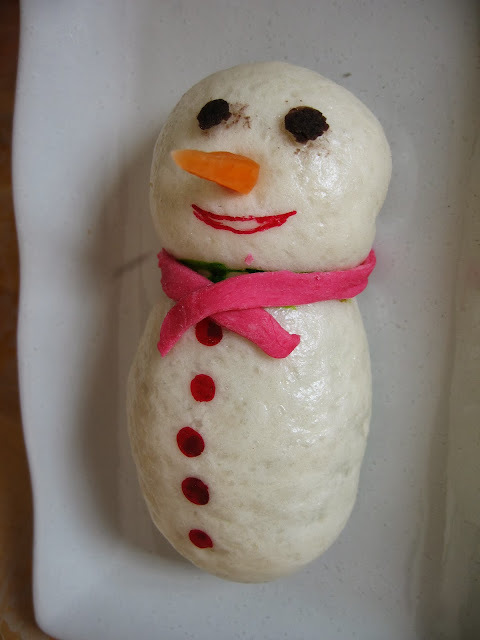 So, wanting to join in the Christmas festivity, I set out to make some snowman buns today. Here is my humble attempt at making snowman buns. 1. Mix pau flour and yeast together. 2. Dissolve sugar in the hot water. 3. Mix all the ingredients in a large mixing bowl and knead dough with hands for 10 to 15 minutes or by electric mixer until it becomes smooth and extensible. 4. Leave the dough in the bowl for about 1 hour to allow the dough to develop and rise. 5. Cover the bowl with cling film or a towel. 6. After an hour, punch down the dough and divide it into 15 portions of 40g each and another 15 portions of 20g each. 7. Divide the red bean paste into 15 portions of 10g each and another 15 portions of 30g each. 8. The 40g dough is for the snowman's body while the 20g dough is for the snowman's head. 9. 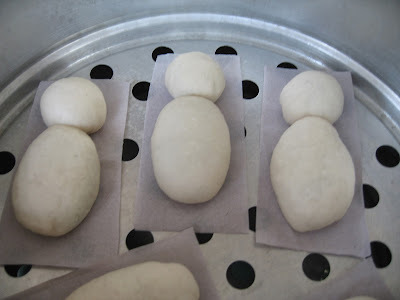 Roll out the 40g dough and wrap 30g of red bean paste to form an oval shape for the snowman's body. 10. 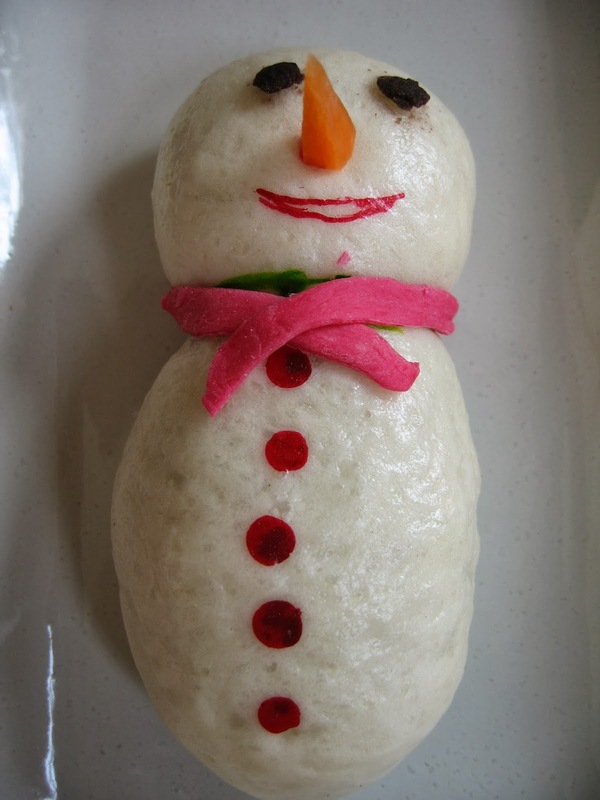 Roll out the 20g dough and wrap 10g red bean paste to form a ball for the snowman's head. 11. Stick the two pieces of wrapped dough together and place onto a piece of grease-proof paper. 12. Repeat the process with the remaining dough. 13. Let it proof again for about 30 minutes. 14. Place the buns into a steamer and steam for 15 minutes. 15. 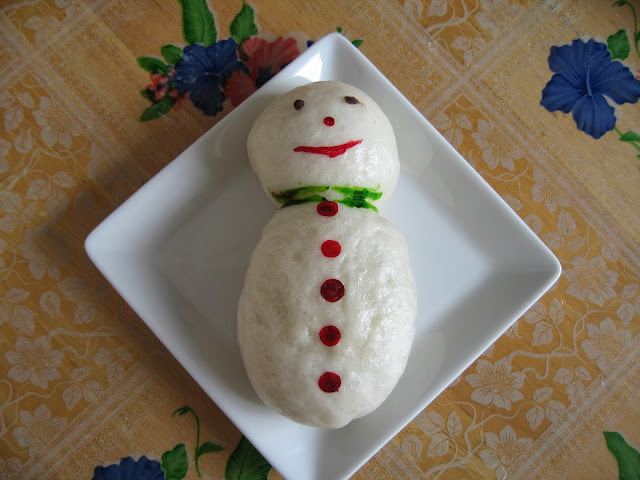 Decorate the steamed buns with eyes, nose, mouth and scarf to make the buns look like snowmen. These buns look so cute! Hi dear ladies, Thank you so much for your feedback and encouragement!